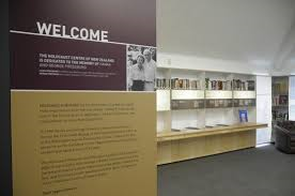 The experience of the Holocaust - as told through first-hand account testimonies of Holocaust survivors who came to New Zealand to make a new life. Our display panels feature explanatory texts, interspersed with personal stories of survivors, quotes, original photographs and images, artefacts and video interviews. This exhibition is about nine Jewish women from different countries and backgrounds, who survived Auschwitz and later came to New Zealand. This exhibition featured 11 artworks (and the personal stories behind each) created immediately after the liberation and up to 1947. The exhibition looked at how survivors reacted to the liberation through art. hours by prior arrangement. We are closed Saturdays and some Jewish Holidays. Entry is free - however we appreciate any and all donations. HCNZ is a registered charitable entity and donations are tax-deductible. Donations over $5 are eligible for a GST receipt - and we issue a receipt upon you supplying your name, the amount of donation and contact details. 80 Webb Street, Te Aro, Wellington 6011. Open Sunday - Friday 10am - 1pm, and outside these hours by special arrangement.